KATHMANDU, May 2: In June, 2014, the evaluation of proposals for building the Mugling-Narayanghat road section was in the final leg and the Department of Road was waiting for the final response from the World Bank, the financer of the project, to sign the contract agreement and kick start works. But a correspondence by the World Bank's regional office for South Asia changed the course of the tender process and the tender was terminated after few days. This termination of the project financed by World Bank credit however became costly for Nepal as it lost potential benefits of 30 percent below competitive bidding and also a time overrun of minimum one year due to re-tendering. The correspondence was about disqualifying three lowest-bidding contractors from the bidding process arguing that they had missed to fill in one of the pages of the bidding document - a minor issue which has traditionally been overlooked. Joint secretary of the Department of Road, Sanjay Kumar Shrestha, who directly oversees the project, said, “It was not a flaw based on which they could be disqualified as they had clearly quoted prices in bill of quantity and submitted other essential documents.” Shrestha, however, refused to give the names of the disqualified contractors. But the World Bank's officials kept on insisting to disqualify those contractors who hadn't filled minor details in their bidding document. The arguments and counter-arguments between the officials of the Ministry of Physical Infrastructure and Transport and Department of Roads and World Bank went on for few days and finally officials of the government of Nepal gave up and the tender process was terminated over 'a very minor issue'. “Termination of the contract process was the only option we had because we could not decide to disqualify those three contractors without pre-informing them about the minor form filling flaw and award the project to the contractors chosen by the World Bank. 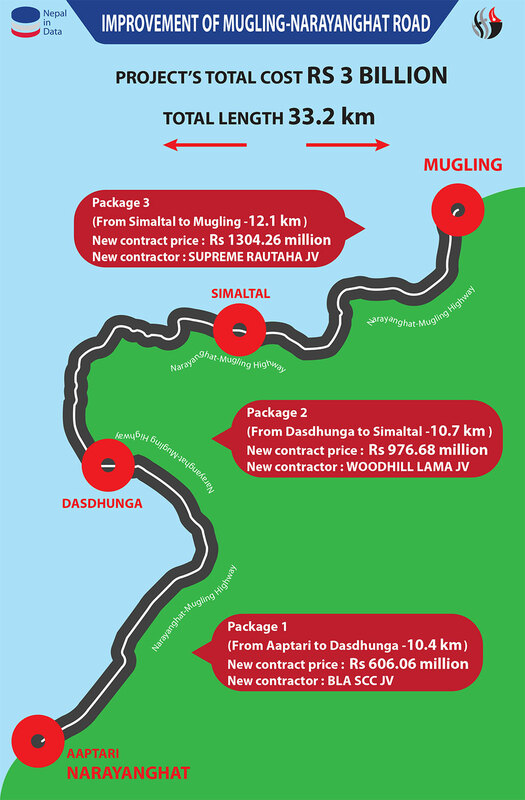 That would incur an additional cost burden on the government,” said Shrestha adding that the contract price quoted by the WB-chosen contractors was higher by about Rs 200 million on each of the three packages of the project. “The state coffers would have incurred a direct loss of Rs 600 million in a project of Rs 3 billion,” he said. A retired government official who had direct knowledge on the matter of this tender claimed that this was probably the weakest ground to terminate contract process in the history of project management in the World Bank. “The three contractors who the World Bank wanted to disqualify were themselves behind the termination of the tender process. These contactors had proposed to build the project at a price 30 percent lower than the estimated cost of the project. But later they realized that they could incur a huge loss as they had bid low,” said a source seeking not to be named, adding, “So, they wanted to walk out of the bidding process and for that they influenced the decision-making level to use the minor flaw to demand their disqualification. This way they saved the amount (five percent of the amount they had bid for the project) which they had deposited as bid security in case they had to remain absent from signing the contract agreement if they would have been selected for the project. The amount deposited as bid security is not refunded if a contractor doesn't sign the project contract even after being selected for the project. Another source at the Department of Road also said that there had been manipulations in evaluations process. “The three contractors in cahoots with some senior officials of the Department or Road managed to influence the World Bank office to tweak the tender awarding process in the eleventh hour,” claimed the source. The three contractors - Himdung & Thokar Construction Company and two others whose names could not confirmed - were the lowest bidders, proposing to build the project at a price up to 30 percent lower than the estimated cost. They started lobbying with the World Bank to get them disqualified from the bidding process through the officials of the Department of Road and were also successful. “The minor reason cited to disqualify the contractors in the eleventh hour implicitly implies that the World Bank officials were influenced by the contractors,” claimed two sources privy to the matter. “A similar contract of Road Sector Development Project (RSDP) funded by the World Bank was signed just a week before this termination and the contractors had filled the tender forms in the same way,” revealed Shrestha who questioned the World Bank's demand to disqualify the above-mentioned three bidders in the Mugling-Narayanght road project. Tulsi Sitaula, former secretary of the Ministry of Physical Infrastructure and Transport, said, “We had sought the permission of the World Bank to sign the contract with the lowest bidder But the World Bank did not issue permission pinpointing the reason for not filling in a page of the tender form properly,” added Sitaula. The contract for the Mugling-Narayanghat road was awarded in 2015. The project is still incomplete and has again both time and cost overruns. The three bidders selected for the three packages of the project through the second round of tender process have proposed building packages 1 and 2 of the project at, respectively, 20 and 6 percent less than estimated costs while the bid amount for package 3 is higher than the estimated cost. Asked their opinion on such 'influenced decision' causing a loss to the country, the World Bank's Kathmandu Office, regional office for South Asia, Washington DC-based headquarters did not respond for three days. Senior transport specialist of the World Bank, Diep Nguyen-Van Houtte, who was overseeing the project from Bank's office in Washington DC at that time and two contact persons of the World Bank for South Asia, Elena Karaban and Alexander Anthony Ferguson said they were traveling and asked to contact Yann Doignon, who also did not respond to Republica's email for three days.